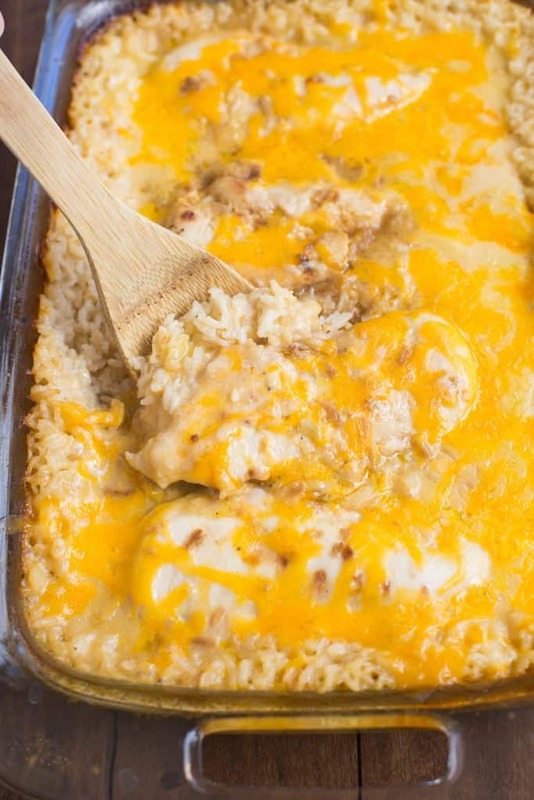 My family loves this easy One Pan Cheesy Chicken and Rice casserole. Just a few short minutes to throw together and let the oven do the rest. Here’s what a nerd I am when it comes to cooking. For my 14th birthday a friend gave me a cookbook… and it was one of my favorite gifts! 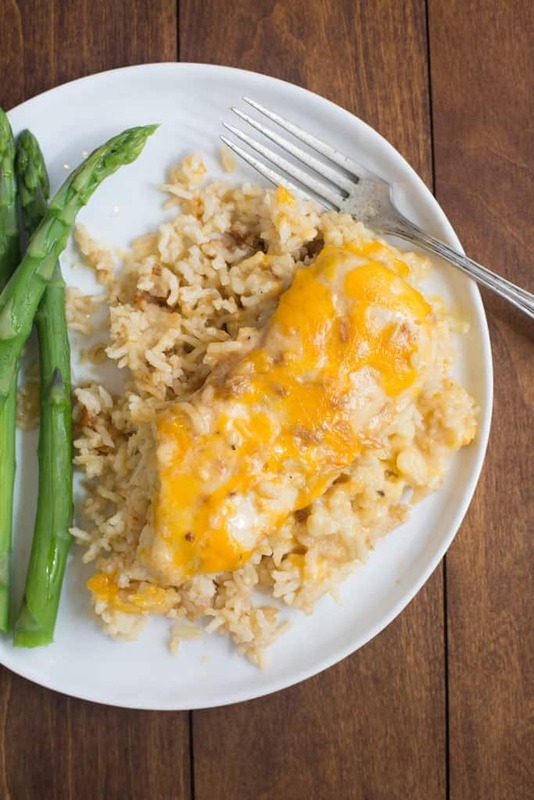 It was a compilation of favorite recipes from close friends, and one of the recipes was this cheesy chicken and rice casserole. What 14-year-old is thrilled about a cookbook?! ME! I’ve just always loved trying and experimenting with new recipes. And, I still have that cookbook in my large collection of favorites. 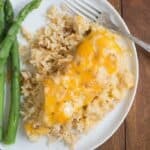 This One Pan Cheesy Chicken and Rice casserole is as easy as it sounds, and as simple as it looks. You add uncooked rice, raw chicken, and a few other ingredients to a pan and bake it for about 2 hours. The end result is a delicious, flavorful, totally kid-friendly casserole. The perfect comfort food for an fast weeknight meal or Sunday dinner that requires hardly any prep on your part. I love recipes where the oven does all of the work. Add rice, cream of chicken, milk, water and onion soup mixture to a bowl and stir to combine. Pour mixture into a 9x13'' pan. Sprinkle half of the shredded cheddar cheese on top. Season chicken with a little bit of salt and pepper. Nestle chicken breasts into the rice mixture. Cover the dish with tinfoil (the pan will be very full!) and bake for 1 hour 45 min - 2 hours, or until rice and chicken are cooked. Remove from oven and sprinkle with remaining cheese. Serve with fresh steamed veggies or salad. Oh man, last night we made something similar but with broccoli in it and it was so good. BUT, we didn’t use onion soup mix or cheddar cheese, we were totally missing out! Thanks for the great tips! Definitely will follow this one the next time we make it. Thanks Benny! I love the idea of adding broccoli, too! If you don’t have Cream of Chicken Soup, could we still use Condensed Soup? Can you use brown rice instead of white? Hi Marilyn, I haven’t tested this with brown rice yet, but it could work–my only worry is that the chicken would get overcooked because brown rice takes longer to cook. This could be solved by using chicken thighs instead of breasts. Then add 1/2 cup more liquid and bake it for about 30 minutes longer. That should work… I’d love to hear if you try it! Hello, what spice combo would you recommend if we don’t use the Lipton soup mix? My hubbie is on a low sodium diet. Thank you! Can minute rice be used? Hi Shelley, it is likely that your dish will be mushy if you use minute rice! I’m using same amount of chicken, but it’s diced. Do you think I should still cook it for the same amount of time as I would using whole chicken breasts? Hi Patty, if you diced the chicken than it will not need as much time, however, you want to make sure the rice is fully cooked. Can I assemble this meal and put it in the freezer then cook at a later date? Ours came out soupy what did I do wrong? I’m sorry it didn’t turn out well for you. I wish I could help figure out what went wrong- I would need a few more details. I wonder what type of rice you used, if you used the correct amount of liquid, and if you baked it long enough? Is it just me or does that seems like a lot of liquid?